Join us for our weekly worship service in the sanctuary on Sundays at 10 a.m.
April 7: Pastor Paul will be preaching. Do we have a practical or extravagant faith? Read John 12:1-8. April 14: Palm Sunday. 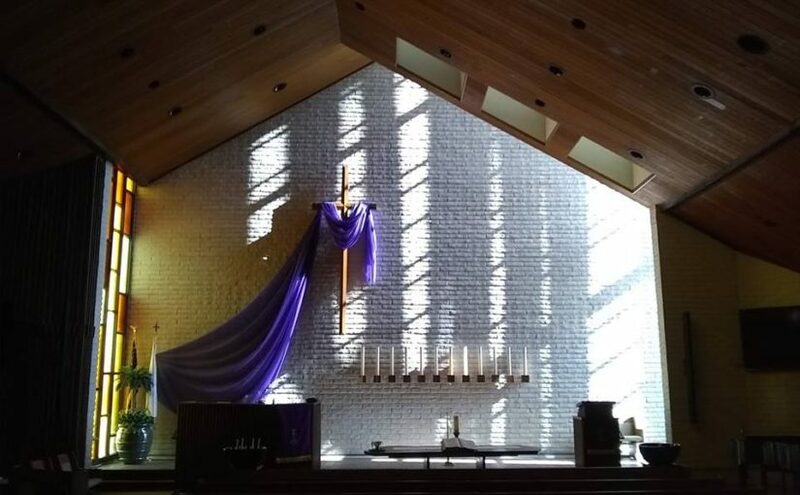 Our Sanctuary Choir will share a musical presentation, Reflections on Holy Week. April 18: Maundy Thursday. 5:00 p.m. We’ll host a community service that will include our sister church – United Church UCC. Communion will be served. April 19: Good Friday self-directed labyrinth walk 12:00 – 3:00 p.m. Bell choir plays at 12:30. Early Service at 8:00 a.m. Pastor Jim will be preaching from Luke 24:1-12. Our hope is in the risen Christ. Worship will be on the patio. Easter Worship at 10:00 a.m. The story is familiar. Can you notice anything new in the resurrection story? Pastor Paul recently did. He will reveal it during the sermon. Read John 20:1-18. April 28: Pastor Paul will be preaching. Read John 20:19-31. What are the characteristics of Jesus that identify him as the Risen Christ? May 5: Read John 21:1-19. Pastor Paul will be preaching about life after Easter. What are we called to do and be after the resurrection? Communion will be served. May 12: Pastor Paul will be preaching around the theme of a tearless time. Psalm 23 and Revelation 7:9-17 are the texts. May 19: Pastor Jim will be preaching. May 26: What is the one thing that you and I should be doing as a disciple of Jesus Christ, as we put our faith into action? Acts 16:9-15 will supply the text. Pastor Paul will be preaching.